I wanted to love this game. I really did. I am, as anyone on staff here will tell you, a tragically obsessive Total War fan. I’m also a history nut, who was looking forward to conquering the known world at the head of some thundering (and in this game’s case very British) Roman Legions. Looking the setting, at early media of the game and developer Creative Assembly’s track record, I didn’t think it was possible for this game to disappoint. But hey. It has. Bummer. Rome II is what happens when a game’s good parts are undermined by the technology holding them up. So we’ll start, then, with those good parts. Battles are looking better than ever. Maps have a greater variety to them, they’re larger, they feel more “alive” (less like arenas). Units are more individually modelled, making armies look less like strength meters and more like bodies of men. You even get little Generals giving little speeches before the battle. No game can capture the clash of thousands of tiny little soldiers better than this one. The most tedious part of Total War games - improving your buildings - has been streamlined greatly here. All your buildings are now back inside a region’s single settlement, meaning no more “oh I forgot there was a lumber yard up here” moments, or endlessly panning over the map looking for farms to upgrade. Regions are now lumped together in groups of 3-4, and you can issue build orders to all cities in the same group from the one place. Handy. The limited scope of Shogun 2 is gone; the game map is massive here, and varied, giving you a lot more strategic approaches than its predecessors “two corridors lead to Kyoto” approach. Everything else remains largely untouched. This is a Total War game. That’s what they do. 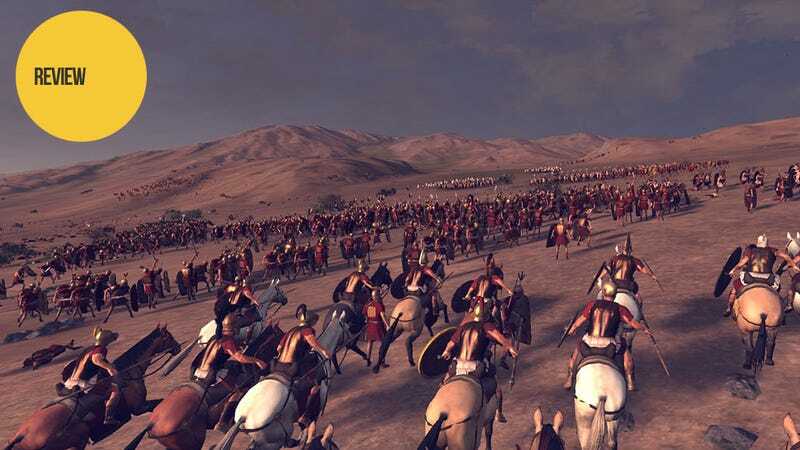 There’s a basic formula of economy, movement, research and combat that have underpinned the games since their inception, and that’s still there in Rome II. So, more of the same, only better. Standard sequel fare, we’re all happy, pats on the back all around, right? Nope. Not in this case, because much of the good work done above is undone by some surprisingly serious performance and AI issues. The campaign map is a drag. Literally. Despite besting the game’s recommended specs in every regard, the campaign map ran at comically low framerates for me (lowering settings had almost no effect), sometimes hanging when selecting armies or panning over water, and a couple of times freezing so severely the game crashed (note: this has long been a problem for the series, particularly with Shogun 2, but for me this was the first time it graduated from “annoyance” to “this is really affecting my ability to play this game”). Considering it’s where you spend much of your time in the game, this was a serious problem. Not as big a problem as how long it takes the AI to make a move, though. Here’s how most turns in Rome II will go down: player will quickly survey their areas, maybe improve one building, maybe move an agent. If you’re not involved in a battle, we’re talking 30-60 seconds of active gameplay. Which is then followed by 3-5 minutes of waiting around as the AI takes its turn. If your next turn is also one free of action, well, you can see how huge swathes of time spent “playing” Rome II are really spent doing absolutely nothing at all. While we’re talking about the AI, know that in some cases it’s the worst yet seen in a recent Total War game, and that’s saying something. In battles, I’ve seen boats pinwheel on the spot, and enemy armies cluster outside cities and not even engage my forces. On the campaign map, conquered regions result in 2-3 turns of small rebel armies annoyingly throwing themselves at your garrisons, and those glacial AI turns are made even worse by constant diplomatic requests that are the work of crazy people. So, yeah. It’s all a bit of a shambles! There are some parts of this game that are just wonderful. The first time you engage the new cinematic camera (as seen in the top screenshot) and watch a Legion smash into a wall of Celts, you’ll think, “this is what strategy gaming should be”. Then you’ll sit around for ages doing nothing, and think “oh”. There’s good and bad news here. I did not enjoy my time with Rome II. There’s just too much wrong with the performance and AI. That’s the bad news. The good news? Few of my main issues with the game are down to bad design. They’re related to things that can, with tweaks, testing and optimisation, hopefully be fixed. Should Creative Assembly come back in a month or two with updates (which they claim to be on top of) that can whip this thing back into shape, then this game’s cinematic flair, scale and streamlined management will be worth a second look. Until then, though, and as much as it pains me to say this, Rome II’s a game you’re going to want to wait on. 10/15 Update: After the fourth patch in five weeks was released over the weekend, I decided it was about time to revisit the game, see if any improvements had been made in terms of performance. The good news is that Creative Assembly certainly had been hard at work. Sluggish campaign performance had greatly improved, AI turns were much quicker and even battle speed, which had run fine at review anyway, was now lightning quick at the same settings. That makes a big difference. I’d abandoned my second campaign in the game due to slow turn speeds and campaign map freezes/crashes, so to simply be able to navigate Rome II’s world and endure load times made a massive difference to my experience. It also gave me more time to actually play the game. For better and worse. Worse first. Upon further reflection, this game is just too damn big. The map’s too big, the campaign systems are too big. It’s as though CA wanted to just go big with the game without thought as to why they were bothering, or what the additions would actually bring to the table. Politics is almost pointless. Managing slaves and food and money isn’t immersive, it’s distracting and tiresome. And what’s the point of adding so many minor regions and factions if they’re not actually going to do anything? Rome II falls into the same trap Napoleon did, in that it quickly becomes a slave to its narrative. You either play as Rome, or you try and stop Rome. Or at least hold out. Lacking in the variety and surprise of other games in the series - where Poland can conquer India, for example - the replay value of the game is greatly diminished after only a few campaigns. On the “better” side of things, though, is the AI. At least in campaigns. In battles it’s still terrible, but on the main map I noticed a much smarter ability to do necessary things like carry out naval battles, form alliances in war and even respond to your troop deployments and movements. What we’re left with after all this, then, is a game that’s the weakest Total War since the equally-misguided Napoleon. Yet that’s a relative term. I’ve still played this game for over 60 hours after I filed my review, because at its heart, and despite CA’s best attempts to mess with it in this game, the underlying Total War formula still works, and through bright spots like superbly cinematic battles I still find myself playing - and enjoying - the game despite all its flaws. It’s my hope that for their next game, Creative Assembly abandon hopes of making the series’ entries bigger, and just focus on fixing the stuff that’s already there. Because a Rome II with less fluff, but smarter AI, would have been a fantastic game, instead of merely a good one.